These days the idyllic Pacific islands seem to be having quite a lot of action ever since the late 1990s or so. But being in India has its disadvantages, all news is West-centric. Besides the usual neighbourhood focus, we love to know what's happening in the United States and the United Kingdom. The Pacific seems like a galaxy a couple of light years away from India! The only time the India media focused attention on the Pacific was Fiji has political unrest - the numerous coups and political battles between the indigenous Fijians and Indo-Fijians. But little does one know that the Pacific has several interesting things going. Living on scarce natural and economic resources can be interesting. For instance, the tiny Pacific nation of Tuvalu has licensed its internet domain ".tv" to a VeriSign affiliate, dotTV, which further sells domains to .tv to television and media sites. Now Tuvalu gets 20% of dotTV's earnings as royalty - that's estimated to gross USD 50 million! Now how many of us would have realised that .tv belongs to a tiny Pacific realm called Tuvalu? How many of us would have even heard of Tuvalu, in the first place? Now things get even more interesting. There is a small island nation in the Pacific called the Samoa. Governed by the Germans before the World War I, the island state came under indirect British control through a League of Nations trusteeship awarded to New Zealand. But unlike other Commonwealth nations, Samoa drove on the right. Much recently, in 2009, Samoa took a decision to switch sides on the road and like us, in India, Samoans now drive on the right. Samoa had the distinction of being the first nation since the 1970s to switchover. A two day holiday was announced to ease traffic woes! The economic rationale for this was sound - Samoa imports most of its vehicles from Australia and New Zealand - being right hand drives, these cheap imports were unsuitable for use on Samoan roads! hbour, Tonga. So if it is Monday in Tonga (or even its largest trading partners - Australia and New Zealand, Samoa enjoys its Sunday fun. This was cited as an economic dampner. And hence the decision to shift to the westward from the International Date Line. Samoa's eastern neighbour Tonga has a dubious distinction, shared with another Pacific isle, Nauru, of having a significant obese population - 70% plus of their population. It isn't funny that the late King of Tonga, Tāufaʻāhau Tupou IV, was the heaviest monarch in the world, weighing in at over 200 kg at one point of time! I wonder if these mind boggling statistics can be attributed to genetics? That would be good for medical scientists to study! Besides obesity, Nauru also has a dubious record of stripping natural resources without developing the economy. Rich in phosphates, Nauru mined its resources at a feverish pace for exports without building economic infrastructure. Today when the phosphates have run out, the economy is in shambles and unemployment is high at 90%. The country was forced to become a tax haven to survive! The island nation of Palau, east of the Philippines, served host to terror suspects, in anticipation of closure of Guantanamo Bay by the Obama administration. Isn't that taking terror to the idyllic Pacific? The Pacific nations enter the big bad world of global diplomacy when they smartly play off China against Taiwan in the game of diplomatic recognition in return for aid! Tonga, Kiribati and a whole host of Pacific nations have done that to their benefit. Despite its natural beauty, the Pacific remains a fragile ecosystem, that faces a serious threat of decimation from rising sea levels and global warming. 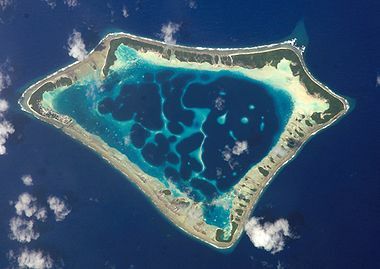 Nations like Tuvalu would be wiped off the globe if climate change is not arrested, its not funny if you are a Tuvaluan. Already, the Pacific waters are turning acidic and sea life is getting scarcer by the day. Natural beauty aside, the Pacific is a vexillilogist's delight. The joy of seeing flags of Kiribati or Vanuatu is matchless. Fiji is also unique in the sense that despite not being a Commonwealth Realm, it flies Union Jack ensign! But the images in my mind are crystal clear. As kid browsing through National Geographic magazine's articles on the Pacific, I was enchanted by the beauty and remoteness of the Pacific! To me, the Pacific is an ideal combination of being with oneself and being with nature. And someday, I would love to go there, to the Pacific, its emerald isles, to the atolls and azure lagoons and soak in nature, before it is lost forever.